The Law Offices Of Jeffrey B. Kahn, P.C. 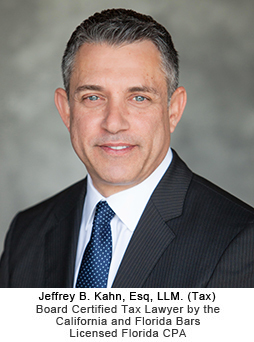 are headed by Jeffrey B. Kahn, Esq., a member of the California and Florida Bars and California and Florida Bar Board Certified in Tax Law. Mr. Kahn earned his JD and LL.M. in Taxation from the University of Miami School of Law and his B.B.A. from Florida International University. He is also a licensed Florida CPA. Tax planning and tax controversies, including assistance with IRS debt problems. If returns from years past remain unfiled, back taxes accrue unpaid, or offshore accounts go unreported, we can help. We can also assist with an IRS lien before the government levies property. No one should face IRS audits or tax problems without a qualified tax lawyer in San Francisco on their side. Estate planning, probate, and guardianship. This includes creation of well-thought-out estate plans for both U.S. citizens and non-U.S. citizens, estate tax planning, probate administration and litigation, and assistance with guardianships. We can assist with the range of complex issues associated with estate planning. Business transactions, including what is the best type of entity to conduct business and contract review and preparation. We can assist with the range of complex issues associated with business startups, succession planning and resolving shareholder disputes. Through our Northern California offices in Walnut Creek, San Francisco, and San Jose, and our Southern California offices in Ontario, Long Beach, Irvine and Carlsbad, all matters are confidentially handled by our professional staff, resulting in high quality, cost-effective service. Contact a tax attorney in Los Angeles or San Diego today. we are available by calling toll-free 866.494.6829. All information remains strictly confidential. No information is released to third parties or government agencies. Read more about our privacy and confidentiality policies. The hiring of a lawyer is an important decision that should not be based solely upon advertisements. Before you decide, please click here to learn more about our qualifications and experience. Fail To Pay In Enough Tax Withholding And Estimated Tax Payments For 2018? Relief May Be Available To You. Are You Effected By The Alabama Tornadoes And Severe Storms? IRS Is Providing You With Tax Relief And Extending Upcoming Tax Deadlines. Don’t Let A Simpler Form 1040 Fool You – Be Prepared For An IRS Audit. Do You Have A Business That Involves Transactions In Cash? Beware Of IRS Required Filings That If Not Followed Could Lead To Penalties And Jail-time.